The ANSWER (Act Now to Stop War and End Racism) Coalition in San Francisco held a community forum on the continuing revolution in Egypt Jan. 25, attended by about 60 people. Two ANSWER organizers, Salma Elshakre and Omar Ali, both Egyptian nationals, had just returned from Egypt and offered their assessments of the ongoing struggle. Elshakre recounted the outcome of the protests calling for the ouster of U.S-backed dictator Hosni Mubarak: “On February 11, 2011, Vice President Omar Suleiman appeared on state TV and announced that Mubarak had stepped down. Egyptians everywhere cheered and celebrated this victory and were looking ahead for a bright future in a new Egypt. Morsi's government continues the neo-liberal policies of Mubarak, relying on the West for foreign loans. The E.U. promised $6.7 billion in loans and investments if Egypt signs an agreement with the IMF for a $4.8 billion loan. Under this agreement, Egypt must sharply cut its budget deficit by reducing energy and food subsidies. Meanwhile, food security in Egypt remains out of reach for the vast majority of Egyptians. Food protests have continued since the uprising, with inflation reaching new peaks. Moreover, nearly two years after Egypt's uprising, security forces responsible for widespread brutality have not been held accountable. A report published in October 2012 by El-Nadeem Center for Rehabilitation of Victims of Torture cited over 247 cases of police brutality during Morsi's first 100 days in office. According to the report, at least eight kidnappings of activists were politically motivated, and the activists were said to have been tortured. The role of the United States has not changed either. “Today,” Ali stressed, “large numbers of tear gas canisters were fired on demonstrators in Tahrir Square, Alexandria and Suez.” The canisters have written on them “Made in the U.S.A,” which suggests the military aid to Egypt has not ended or even been cut back. “The Muslim Brotherhood clearly understands the rules of the game: maintaining the status quo of the geopolitical interests of the United States and Israel,” Ali concluded. Elshakre explained that Morsi issued a constitutional declaration on Nov. 22, one day after brokering the ceasefire, in which he called for reopening the investigations and prosecutions in the cases of the murder, the attempted murder and the wounding of protesters as well as the crimes of terror committed against the revolutionaries by anyone who held a political or executive position under the former regime. While this may sound progressive, Elshakre pointed out that Morsi in the same act broadened his executive powers and isolated the judiciary. This effectively barred the constitutional court from looking into the constitutionality of the composition of both the constituent assembly drafting the constitution and the Shura Council. Morsi also banned any judicial review of this action and all his subsequent decisions until a constitution was passed and a parliament is elected. The U.S. voiced little to no criticism of Morsi’s decision. 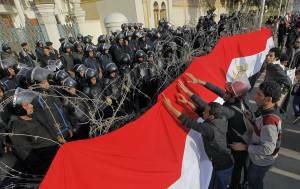 A general strike for Dec. 4 was called for by opponents of the new president who objected to the hurriedly drafted constitution and decrees issued by Morsi expanding his powers. “Major newspapers announced plans to suspend publication, and privately owned TV stations went dark,” Elshakre said. The next day, supporters of the Muslim Brotherhood and President Morsi attacked the sit-in camp that had been set up and heavy fighting ensued between supporters and opponents of Morsi. Perhaps as a result, Elshakre added, “The result of the second round [of voting on the constitution] was 64 percent approval and 36 percent rejection.” However, these numbers are misleading, she said. Egypt’s population is 85 million people. Only 17 million of the 52 million eligible voters went out to cast their vote and the constitution passed with fewer than 11 million votes. “From today's mass demonstrations, we learn that the revolution is a continuous process of mass participation, social reorganization and awareness,” Ali concluded. But the building of a mass revolutionary party is required for this process to culminate in real revolutionary change. A video was shown that demonstrated some of the ways that Egyptian youth had become inspired by the Occupy movement, adopting many of its symbols and slogans. Black bloc groups of masked activists have engaged in street actions, and an entire genre of revolutionary street art has flourished in Egypt's cities. After taking questions and comments from the crowd, the speakers noted how support for the most progressive aspects of the revolution had come from unexpected sources. Elshakre noted how groups of soccer fans had started to function as security for protests and strikes. She described the occupation of subway stations in Cairo in which entire tunnels had been shut down by protesters. She also expressed the opinion that the Muslim Brotherhood could not itself be reoriented in a more progressive direction, but she felt that much of the Egyptian population see the revolution as ongoing and continuous. Ali described the leadership of the Muslim Brotherhood as bourgeois, noting that the second in command owns one of the largest factories in the country. He added, however, that the base of the Brotherhood was working-class, and that many of its members, especially amongst the youth, were leaving the group in the wake of Morsi's rule. Ali noted the difficulties of finding labor or political leadership in the wake of a harsh military dictatorship that crushed any attempt to organize against it. A population proscribed from political activity for over 30 years is necessarily, he noted, untested in political organization. But he expressed confidence that the austerity now being imposed on the Egyptian people would lead to the fall of the Morsi government, and suggested the next wave of revolts will be led by the most oppressed sectors of Egyptian society.